Kaloyan, tell, please, about yourself. 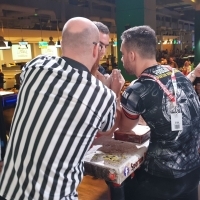 How did you get to armwrestling? – Before armwrestling I was practicing martial arts since I was 6 years old. Around 2005 I realized that I'm able to pin the majority of people I pulled with so I decided to give it ago and started training in a local club. In 2009 I founded Adrenaline Armwrestling Club. What do you think is your main achievement in sport? – I'm a multiple national champion, and I've won prestigious competitions like the Open Class of Socol Maric in Croatia. But I guess my biggest achievements are in coaching and promoting the sport in worldwide magazines like "Man's Health," TV shows and lately my "Time to Grow Stronger" series on YouTube. – I'm a coach since 2009, and I now have coached multiple national champions. My first teammate that I've coached Kaloyan Tumbev has 2nd place in EAC and 2nd place in WAC. My club has more than a few Team Cups from Nationals, and you know how high is the level in Bulgaria. So I guess my coaching merits surpass the ones from competing. How did you get an idea to make a vlog and what is your purpose? What is your channel about? – I started the channel and OmnipotentGrowth.com because I felt that I need to share all the knowledge I gained as a Sportsman, Coach, Manager and a Businessman to the people that want to get better as much as me. As I said, as a professional I'm a Manager and Self-Development Coach, so half of my channel is in the Business area. I'm teaching skills and competencies that can bring you much success in your life. The other half goes to my greatest passion – armwrestling! I think armwrestling is a very intelligent sport and the combination allows both areas to help each other. You need to be stronger in your life and smarter on the table! What is your motto and why? – I have few mantras that I live by, but my favorite one is "Amat Victoria Curam" - Victory loves preparation. You should put the effort if you want something back. What 3 tips can you advise for all armwrestlers? – First, make a long-term mindset. This is a game that you prepare one year to decide who will win in a second. Second, there is always "the next try." Unlike other sports, you can practice armwrestling all your life! So don't overthink, just pull! Third, enjoying over winning! If you make yourself happy when you are training, you will find yourself winning soon enough. You should like the process of preparation more than the gold medals if you want to have a long-term armwrestling career.